Frank Alban with Mundaring Officer In Charge, Sgt John Browne. A KEY result of Frontline 2020 shows that hooning in the Mundaring area has already been curbed. Senior Sergeant John Browne said each local policing team having its own mobile phone number meant community members could ring their resident team directly to discuss problems. The frontline 2020 scheme was developed as a more efficient and effective operating model to keep up with the rapid growth of WA. Swan Hills MLA Frank Alban said the new figures showed the community had embraced the initiative of contacting local police teams (LPTs) to discuss crime issues in their neighbourhood. 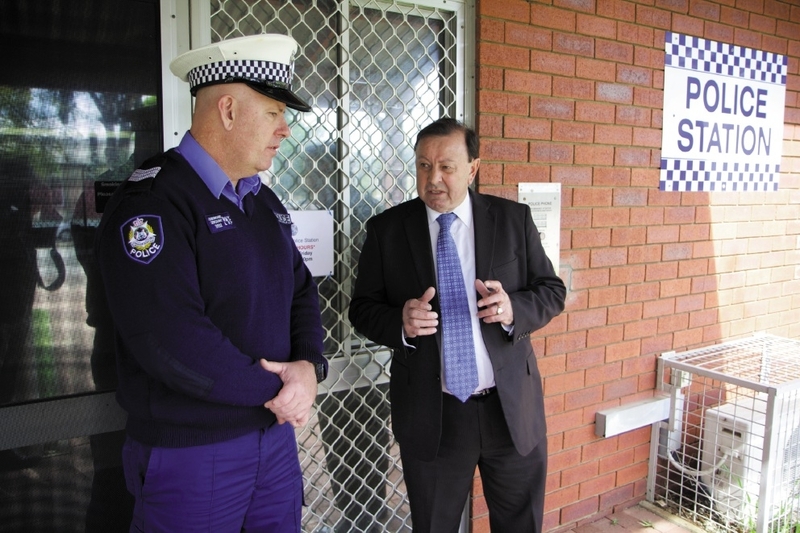 Mr Alban said Mundaring had a problem with hooning before the new policing model, but since it had been introduced positive results were being seen. Mr Alban said a recent review conducted over six days revealed members of the public contacted the 148 LPTs mobiles 472 times. Police Minister Liza Harvey said people had embraced the idea of calling local police teams to discuss crime issues in their neighbourhood since the local teams were given mobile phones nine months ago. “I’m encouraged that the mobile phone initiative which, along with the growing social media use, is helping to build on the relationship between officers and the community,” she said. The review showed that 50 per cent of calls to LPT mobile phones were answered immediately, 50 per cent of unanswered calls to local police team mobiles were returned with two hours and 95 per cent of unanswered calls were returned within 24 hours. “This model strengthens policing in WA and the State Government has developed a website which introduces you to the senior officer in charge of your suburb and a mobile number to contact them on,” Mr Alban said.